There isn’t much that President Trump hasn’t tried in staffing top jobs at the White House. He has tried political operatives. He has tried populists. He has tried nationalists. He has tried generals. He has tried political provocateurs. He has tried family. He has tried New Yorkers. He has tried Goldman Sachs. He has even—briefly—tried The Mooch. At the seven-month mark of his presidency, the results have not been pretty. Polls uniformly show his job approval at an historic low. As fact-checkers have documented, his record of pushing significant legislation through Congress similarly suffers in comparison to his predecessors, despite White House claims to the contrary. His signature campaign promises—funding a border wall, repealing Obamacare, rebuilding infrastructure, and cutting taxes—have either run into roadblocks in Congress or have not yet been introduced. Trump’s difficulties on Capitol Hill and the ouster of senior strategist Steve Bannon on Friday focus attention on what is perhaps the only thing he has not tried on his staff: hiring people with experience passing legislation and intimate knowledge of how government works. Bannon’s experience was in the Navy as an officer, on Wall Street as an investment banker, in Hollywood as a producer, and in the world of conservative media at Breitbart. Never did he have to work with Congress. It is a hole in his résumé shared by most of his former colleagues on Trump’s senior staff. For all the times he was portrayed as an old Washington hand, ousted Chief of Staff Reince Priebus was a relative newcomer to Washington, having come to D.C. in 2011 to head the Republican National Committee. Before that, he spent four years as chairman of the Wisconsin GOP. Before joining the White House staff, he had never had to pass a bill either on the state or national level. His replacement, retired Gen. John Kelly, spent some time at the Pentagon working with Congress, though the bulk of his time in the military was in combat commands. That gives Kelly more experience working with Congress than Priebus had, but considerably less than almost all his modern predecessors as chief of staff. Of the 22 chiefs of staff before Priebus, serving seven presidents, only three had less experience with Congress: Hamilton Jordan with President Carter, John Sununu with President George H.W. Bush, and Mack McLarty with President Clinton. Sununu’s inexperience mattered little since Bush was deeply experienced in Washington as a former member of the House, ambassador, CIA director, and vice president. He had spent years building deep personal relationships with members of Congress. But both Carter and Clinton, newcomers to Washington, suffered from wounds inflicted by missteps of their chiefs. Trump’s aversion to congressional experience is a great contrast to his predecessor. President Obama chose then-Rep. Rahm Emanuel as his first chief, mainly because of his ties to Congress. And three of his four subsequent chiefs came out of Capitol Hill. The other, William Daley, also had extensive Washington experience. That type of résumé is absent among the heavyweights in the Trump White House. Kellyanne Conway, Trump’s White House counselor, was respected as a pollster for her expertise on how women vote. 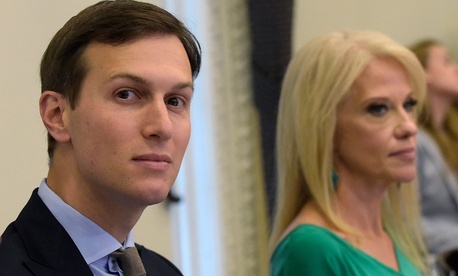 Senior advisers Jared Kushner and Ivanka Trump wield clout in the inner councils because of their family ties to the president, but are neophytes at trying to maneuver through Congress. They are among many New Yorkers who brought no congressional experience to the White House. That group includes Keith Schiller, head of Oval Office operations; Hope Hicks, the new communications director; and, briefly, Anthony Scaramucci—“The Mooch”—the man Hicks replaced. Omarosa Manigault, director of public liaison, briefly worked for Vice President Al Gore before being fired but is best known as a contestant on Trump’s The Apprentice. Also coming from New York was Gary Cohn, who, before being named the president’s chief economic adviser, headed Goldman Sachs. Sean Spicer, Trump’s first press secretary, had experience on Capitol Hill and at the Office of the U.S. Trade Representative. But his most recent years were spent at the RNC, focused more on electing people to Congress than getting their votes. Spicer’s replacement, Sarah Huckabee Sanders, did some work with Congress when she worked in the Education Department under President George W. Bush. But her main experience is in campaigns, including those of her father, Mike Huckabee. That puts great pressure on the few members of Trump’s staff who are respected for their knowledge of the inner workings of Congress, including Rick Dearborn, the deputy chief of staff for legislative affairs, and Marc Short, the director of legislative affairs. Dearborn worked for then-Sen. Jeff Sessions, as did Trump’s senior adviser for policy, Stephen Miller. And of course there is Vice President Mike Pence, who spent a dozen years in Congress before becoming governor of Indiana. The Carter experience suggests that the need for congressional savvy is more compelling when a president is elected as an outsider. Carter later acknowledged that he made a mistake pushing so many major issues at the same time. “There were always 12 or 15 bills that we were trying to get through the Congress at any one time,” he said in an oral-history interview with the Miller Center of Public Affairs at the University of Virginia. Congress, he learned, can’t handle that much at the same time. In contrast, he said, President Reagan had more success focusing on a smaller number of priorities. Carter said he was additionally hindered by running against the political establishment in 1976—as Trump would do in 2016. “I didn’t have any obligation to the people in Washington for my election. Very few of the members of Congress, or members of the major lobbying groups, or the distinguished former Democratic leaders, had played much of a role in my election,” he said, adding, “I just didn’t have that sort of potential tie to them, and I think they felt that they were kind of on the outside.” He said he learned “very quickly” that “there was no inherent loyalty to me” among members of Congress. Four decades later, Trump is learning the same lessons about congressional know-how on his staff and about loyalty on Capitol Hill.